The grouping identifies biotechnology and health innovations, space science and technology, and new and renewable energy as key areas. The BRICS grouping, which comprises of Brazil, Russia, India, China and South Africa, have identified science, technology and innovation as key areas of cooperation after a meeting in Kleinmond, South Africa. The science and technology ministers of the five countries met on February 11 for the first BRICS Science, Technology and Innovation Ministerial Meeting, according to Xinhua. Hanekom said biotechnology and health innovations, space science and technology, and new and renewable energy were “strategic areas where South Africa sees potential not only for synergies, but real opportunities for extensive cooperation” between the BRICS countries, according to the report. Also on the meeting’s agenda was the tabling of a memorandum of understanding aimed at strengthening cooperation in science, technology and innovation and addressing common global and regional socioeconomic challenges through appropriate funding and investment instruments, Xinhua said. The South African minister also called on the BRICS countries to develop new and renewable energy, according to the report, which was carried on The People’s Daily website. 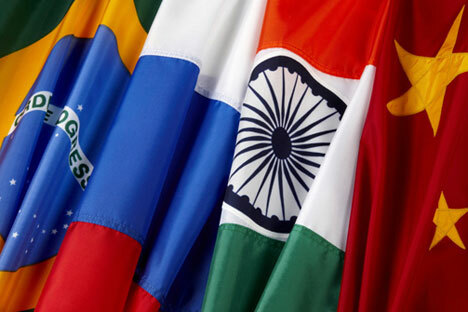 The 2014 BRICS summit is likely to take place in Fortaleza, Brazil, in July, where economics will have the highest priority. The grouping is likely to continue efforts to reform the international financial system where a considerable overbalance exists in favour of the West. Last week, Alexei Likhachev, Russia’s deputy minister of economic development told RIR that the grouping would look to stimulate trade and was working on a roadmap to promote reciprocal investments.